TRIFLES features Jaimee de witt Bedford, Zoe Nadig, Matthew Meehan, Linden Rockney, and Simon's Rock Alumnus, Theo Gabriel. THIS PROPERTY IS CONDEMNED features Zoe Nadig and Matthew Meehan. THIS PROPERTY IS CONDEMNED, by Tennessee Williams, is one of his most acclaimed one-act dramas. Written in 1946, it is possibly a study for Blanche in his major play A Streetcar Named Desire, which premiered in 1947. Williams, one of the first openly gay American playwrights, won two Pulitzer Prizes for Drama for Streetcar and for Cat on a Hot Tin Roof. 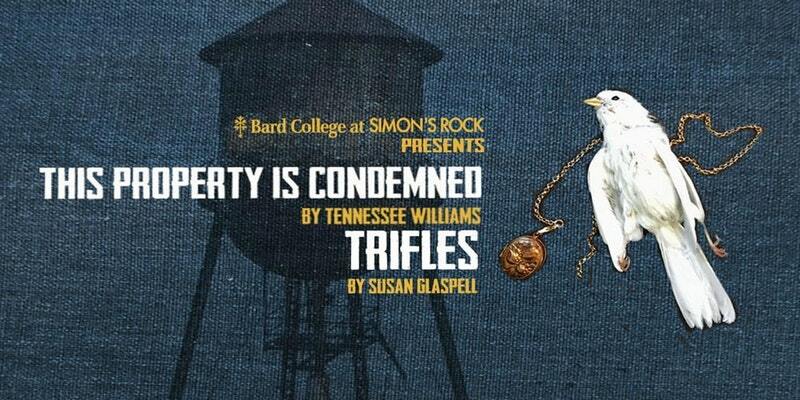 TRIFLES is a suspenseful drama set on a remote farm in the Midwest, was written by Susan Glaspell in 1916, and is considered a masterpiece of the 20th century. Glaspell, a major female playwright, was a co-founder of Provincetown Players and winner of the 1931 Pulitzer Prize for Drama for her play Alison's House.